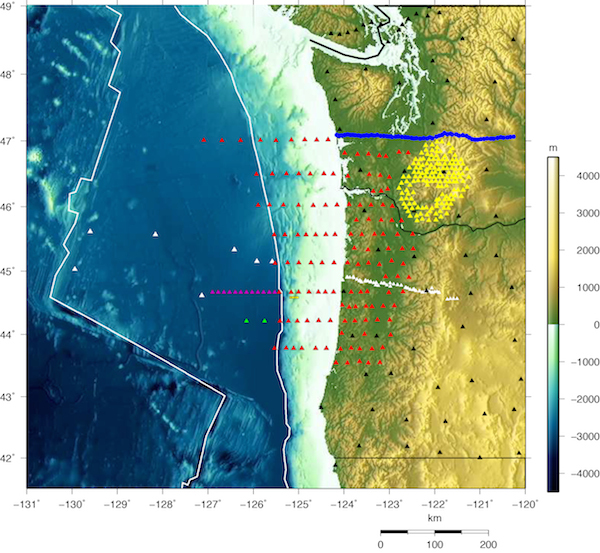 This is a collaborative project to image details of convergent margin segmentation and the distribution of fluids associated with the subducting slab using combined onshore and offshore magnetotelluric (MT) data in Oregon and Washington. This data will allow us to image the electrical conductivity of the crust and upper mantle of the subduction system in 3D to map the distribution of fluids, constraining both the fluid input to the system from offshore and the distribution of fluids released from the down-going slab, including along the transitional zone where episodic tremor and slip (ETS) occurs. Onshore MT data was collected in 2012-2014 and the offshore data is being collected in April-June 2014. June 11, 2014. 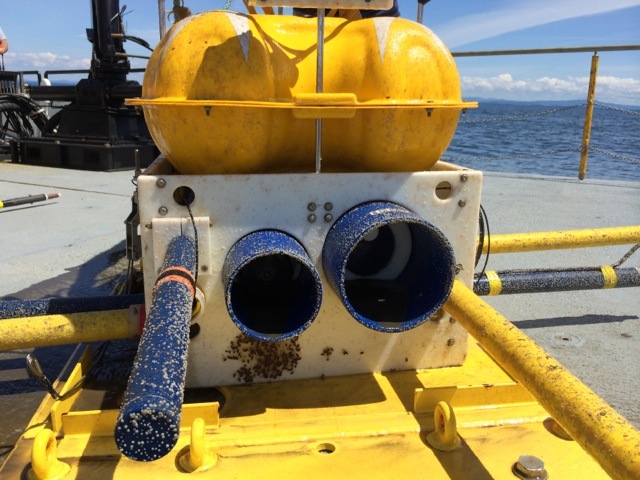 Today we've been recovering instruments deployed on the two lines straddling the Columbia River outflow and the receivers have been coming back covered in mud. 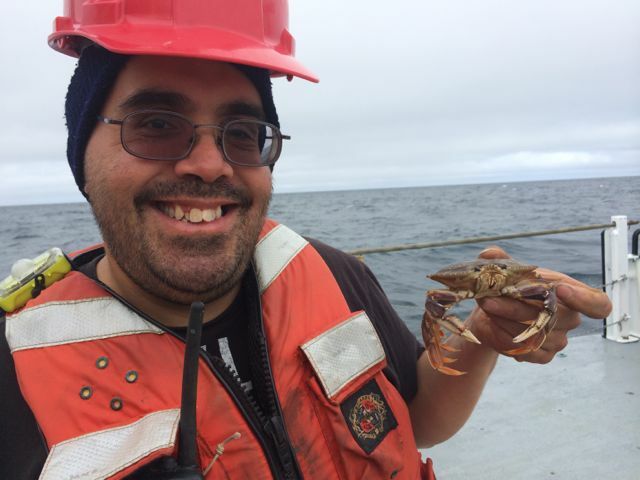 One receiver had been deployed in only 50 m of water just a few miles offshore and it came back covered in barnacle growth, mud and snails. 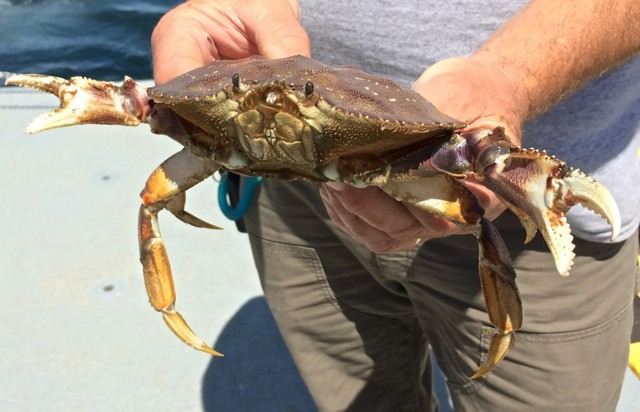 There was a stow-away female crab that Jake found inside the stray-line well in the middle of the yellow float package. 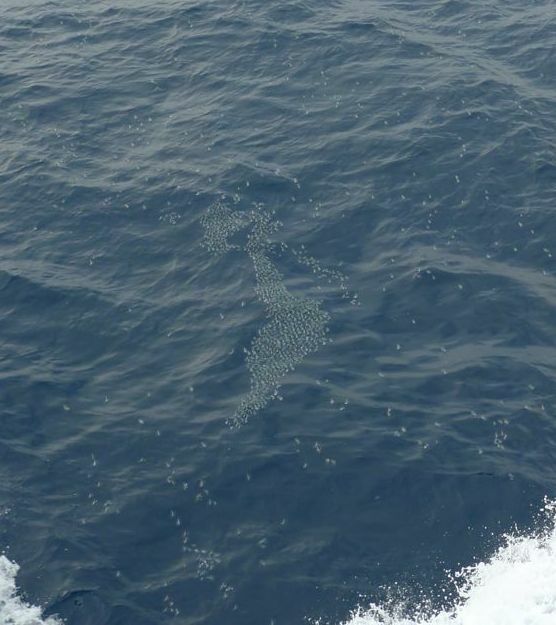 We	have also	been seeing small pods of humpback whales all day long. 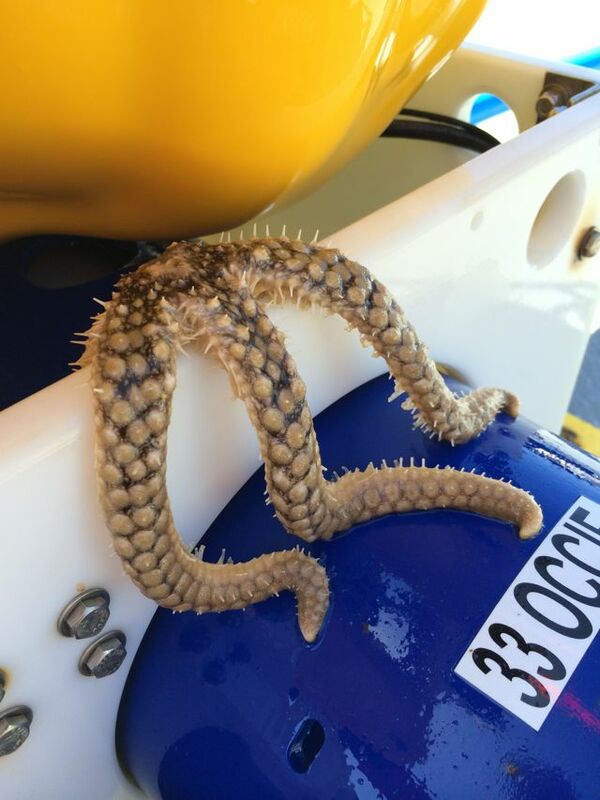 All in all another interesting day at sea! 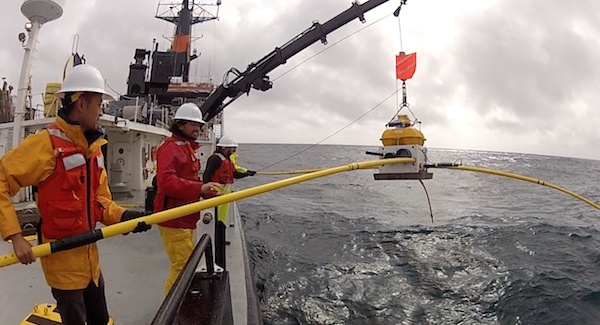 June 10, 2014: We've retrieved 34 MT stations so far and hence are about half-way through the recovery cruise. The data is looking really nice and I'll post some samples latter on this week. Today was our first mostly sunny day and the winds were down, so it was enjoyable to be on deck without our usual complement of foul weather gear. 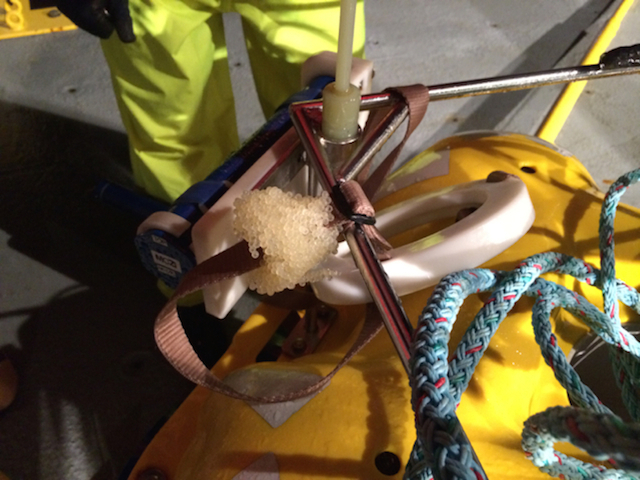 And as an added bonus we got a packet of mysterious eggs on this receiver, which spent the last month sitting on the seafloor beneath 2500 m of seawater. June 9, 2014: The cruise is now well underway. 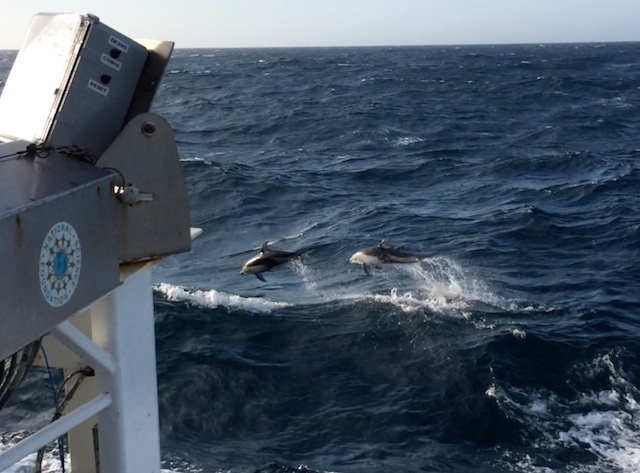 The first day we ran into some rough weather with high winds and wind swell that really rocked the boat so to speak, which made it a tough first day for most of the science party (myself included). 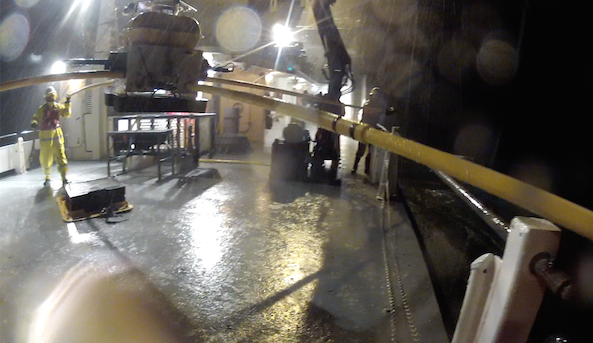 Since then the weather has let up and we've been making good progress recovering the gear from the seafloor. We've already recovered the three southernmost lines of receivers (see map below). Since we are ahead of schedule, we re-deployed 13 receivers out onto the abyssal plain (magenta symbols on the map) so we can constrain the electrical conductivity of the incoming plate and study the lithosphere-asthenosphere boundary. 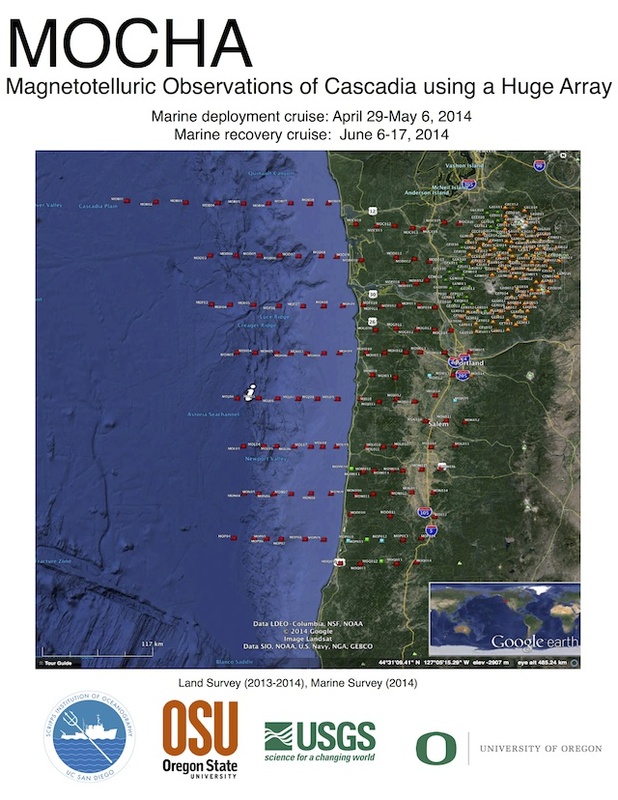 Those stations will be recovered at the end of the cruise. 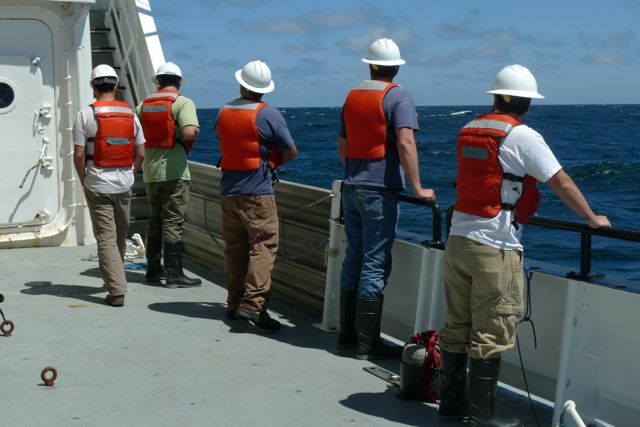 So while the weather could be better, all in all we have nothing to complain about --- good food, good crew and every instrument so far has come back with good looking data. The science party has split into two teams of four (one works noon-midnight and the other midnight-noon). 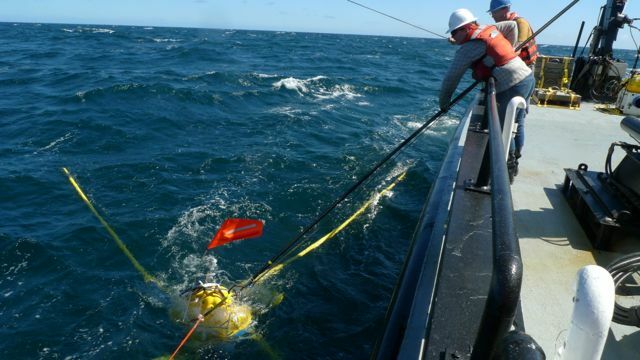 Here's a photo from just after lunch today when both teams overlapped on an instrument recovery. 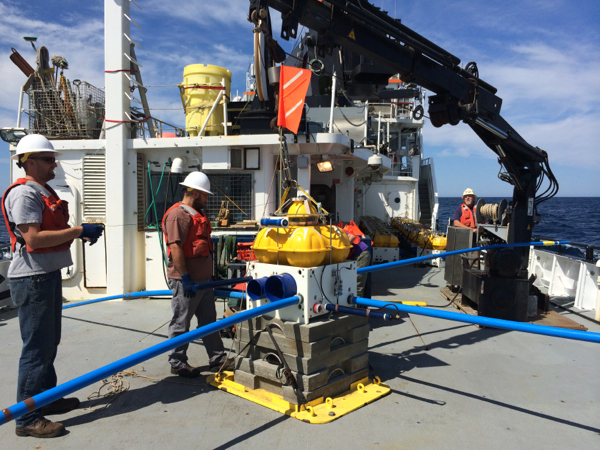 A lot of time on the ship is spent waiting for the receivers to surface. They float up from the seafloor at about 20 m/min, so the deepest stations on the abyssal plane take about 3 hours while the shallowest stations on the continental shelf only take a few minutes. Here's Colin Durkin, a future Humboldt State undergraduate keeping warm while waiting for the next recovery. June 6, 2014: The MOCHA recovery cruise is just about to begin. 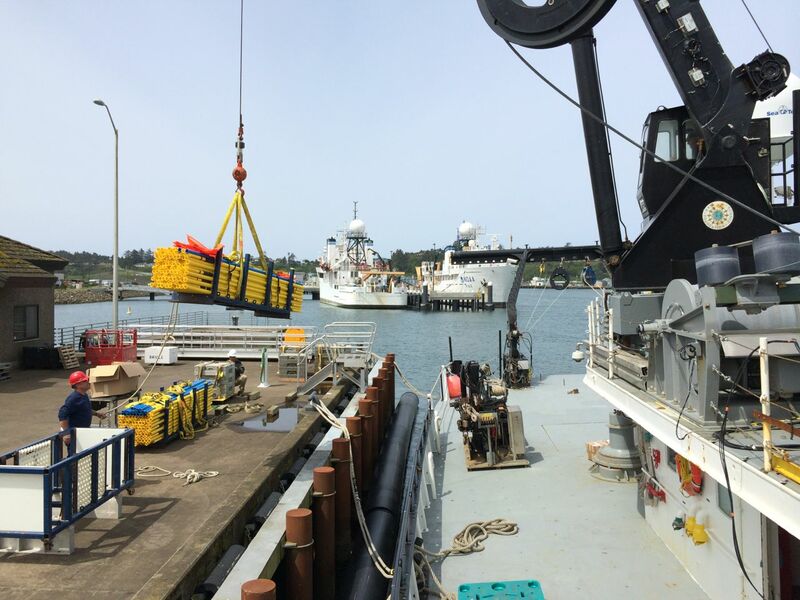 Our team of eight people arrived in Newport on Wednesday night and by early yesterday afternoon we finished loading our gear onto the ship and getting things strapped down. 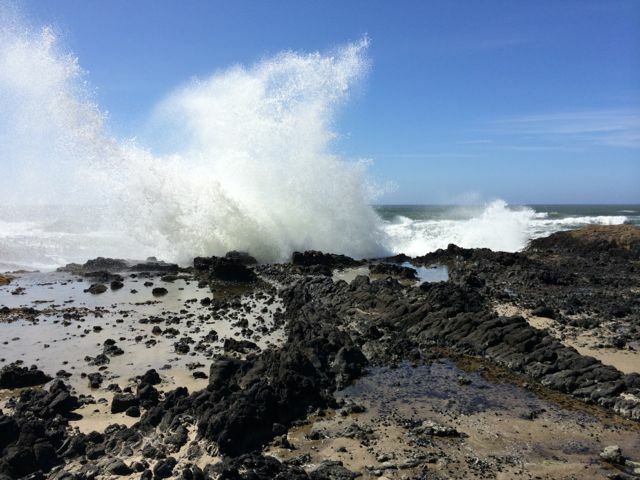 After lunch at the amazingly tasty Local Ocean restaurant, we spent the afternoon checking out Thor's Well at Cape Perpetua park, which is located about 30 minutes south of Newport. The sunny weather we're having and a gradient in pressure have been generating 20-25 kt winds in the afternoon, so we had a spectacular show of waves crashing on the basaltic shoreline, generating some massive sprays. As usual for our cruises, we spent the last night ashore enjoying some beers. When I was here for the Hydrate Ridge EM survey 10 years ago, Newport only had a few dive bars, so we were really stoked to find Bier One, which has a younger crowd, great selection of micro brews and is decorated with the owner's artwork and sculpture. 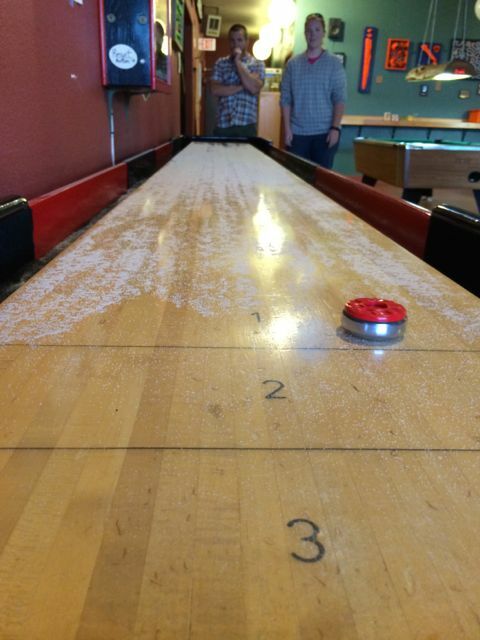 We spent most of the night playing shuffleboard, but it was at the dart board where our Master's students Mike Sly and Thomas Martin showed off their skills and trounced everyone else. Here's a look at Thomas Martin and Georgie Zelenak playing shuffleboard. May 5, 2014: That's it folks, we are all done with the deployment cruise. Yesterday we finished the northernmost line and then beelined for the southern part of the array. 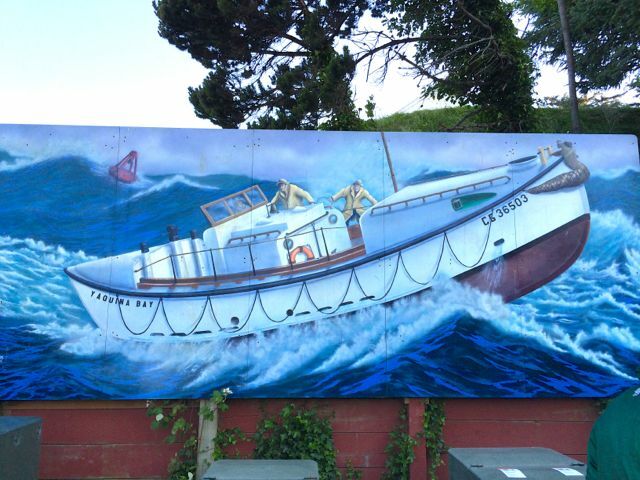 The 18 hour transit was accompanied by 11' swells that showed off the Oceanus' ability to pitch and roll. It was not a fun sleep last night. 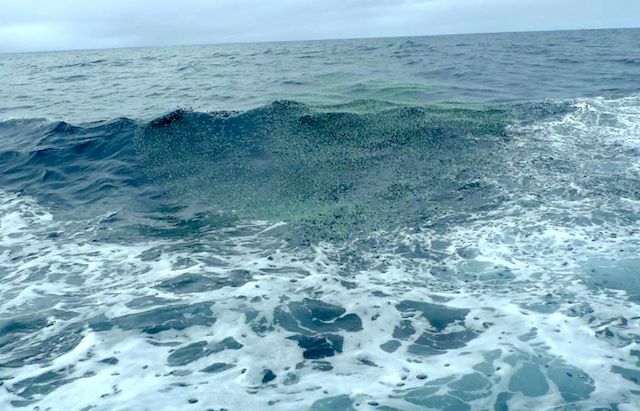 We arrived on line N (2nd up from the southernmost line) by the early afternoon and recovered two receivers and then redeployed them on the abyssal plain (the green triangles in the map below). 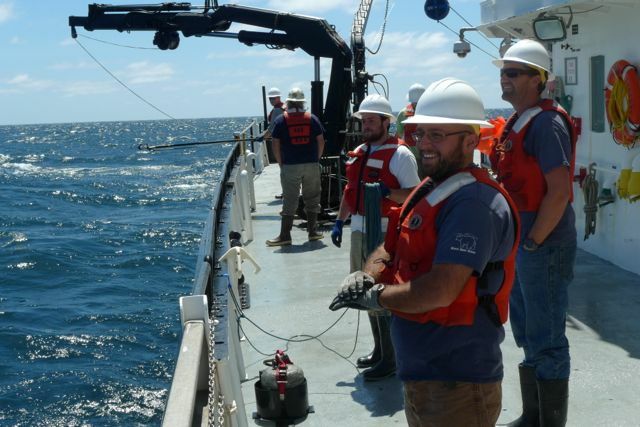 That gave us a chance to look at the data from the two recovered stations. 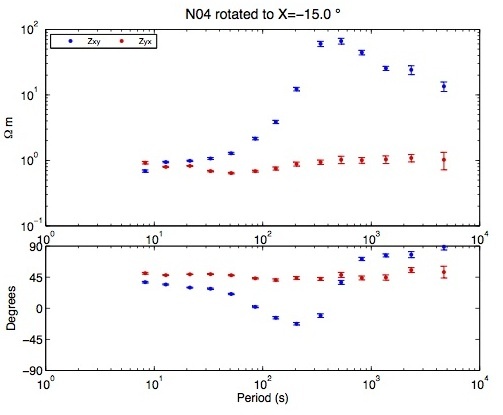 Check out the 15 minutes time series sample showing the Hx,Hy,Ex and Ey channels for stations N04 and N05. Those coherent wiggles are some nice MT pulsations! Here's the MT response computed for station N04, which is located right at the base of the continental slope. 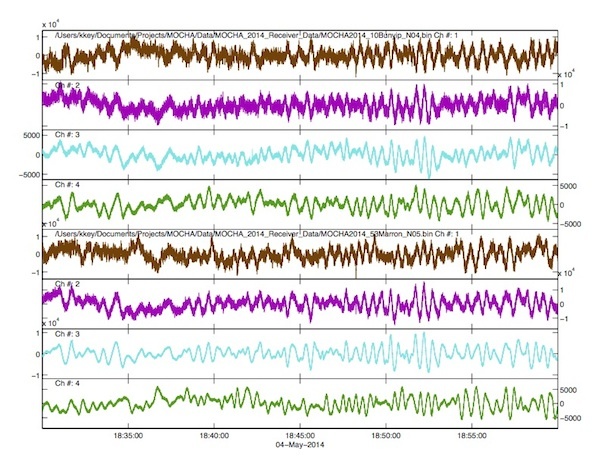 This stations shows a classic sea floor MT coast effect with depressed TM mode apparent resistivity, a TE mode cusp in apparent resistivity at the period where the magnetic field is vertically polarized, and negative TE phases. I'd say its a pretty good MT response for only 4 days recording, so the other stations with month long recordings should be ultra nice! 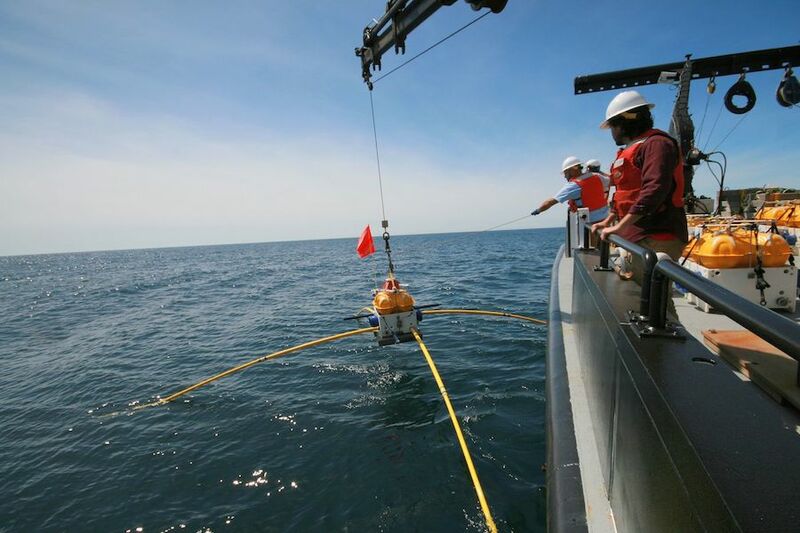 We will use the MT responses collected from the entire array to make a 3D model of the electrical conductivity structure of the subduction zone, spaning from the seafloor and land surface to about 200 km into the mantle. 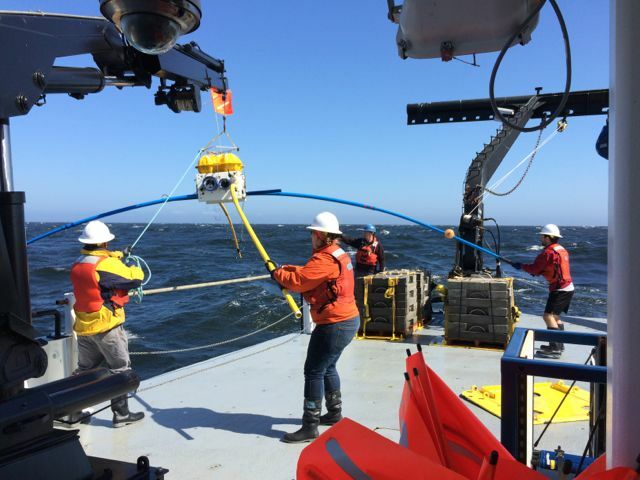 May 3, 2014: We finished deploying the last receiver (#55) around 9 pm tonight and are now headed south to recover two stations and redeploy them out onto the abyssal plain. Here's	a map showing the 55 stations we've deployed (red triangles offshore) and the two we plan to deploy tomorrow (green triangles). The magenta triangles show 12 stations we will try to collect if good weather gives us spare time during the recovery cruise in June. The white triangles show the EMSLAB MT experiment from the late 1980's and the blue triangles show the more recent CAFE MT profile. The yellow triangles are upcoming MT stations OSU and USGS will collect for the iMush project. The white lines show boundaries of the Juan de Fuca and Gorda tectonic plates. May 2, 2014, part 2: I finally got a small 20 MB version of the receiver deployment movie uploaded. Click on the image below to watch. After the cruise I'll post the full 1080p HD version here. Enjoy! May 2, 2014: The nice weather is starting to subside. I got up at 10 am this morning and the night-riders (the midnight-noon crew) were out on a wet deck suited up in their foul weather gear. By the time the day-trippers (noon-midnight crew) started their shift, the sky started to clear and the deck has been dry all afternoon, lucky us. We even saw a pod of three humpback whales (will post photos of that later). However, we are fairly certain this will be the last day of good weather as its supposed to be cold, rainy and bumpy all weekend. 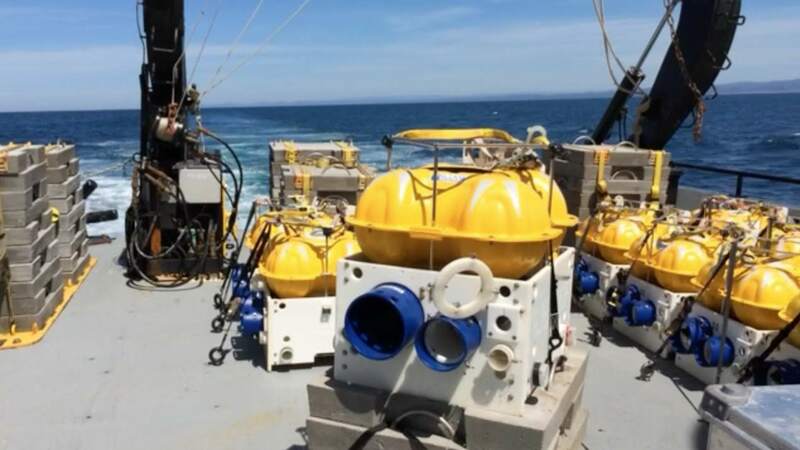 We plan to complete the 55th receiver deployment tomorrow, and then will use Sunday to recover and redeploy two of the abyssal plain receivers. 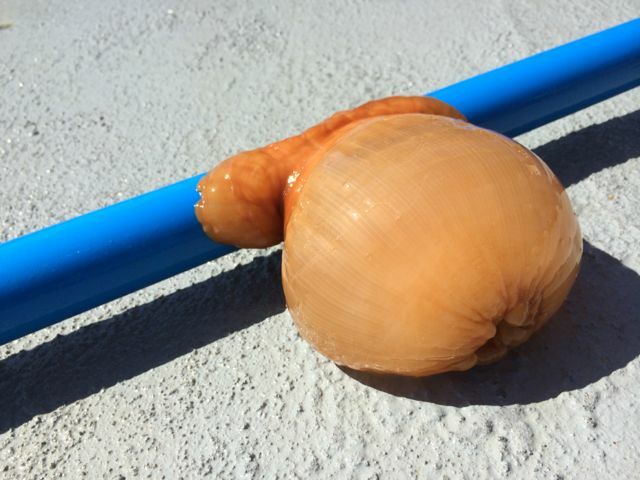 Below are some nice cruise photos taken by Scripps graduate student Yuxiang Zhang. May 1, 2014: Another day of good weather and many EM receiver deployments. We've started having fun with GoPro cameras too. I made a HD movie showing the receivers falling down into the briny deep but its too big for the ship's internet connection to handle. 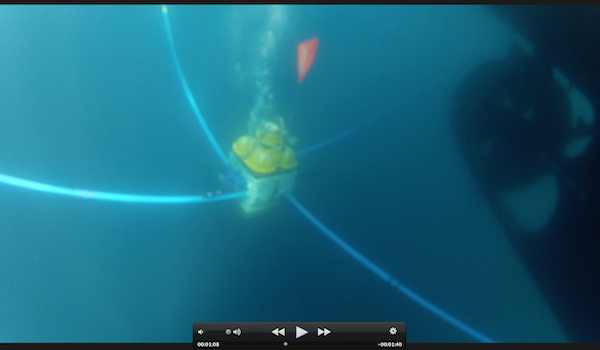 Below is a screen shot showing a receiver falling by the ship's prop. 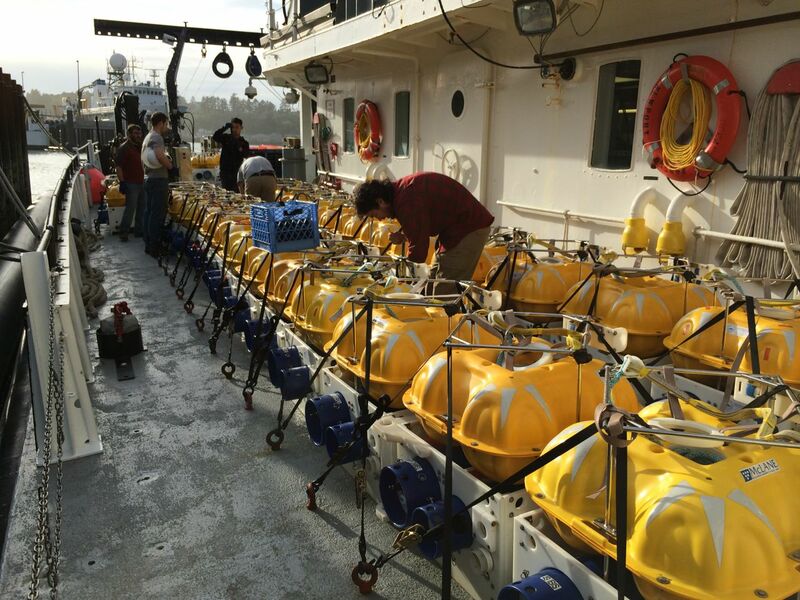 April 30, 2014: The cruise is in full swing and we are way ahead of schedule with 16 out of 55 ocean bottom electromagnetic receivers deployed to the seafloor already. We have been very fortunate with the weather. The >10' offshore swell on Monday has died down to just a few feet and the air is cool and dry. The sky is nearly cloud free. 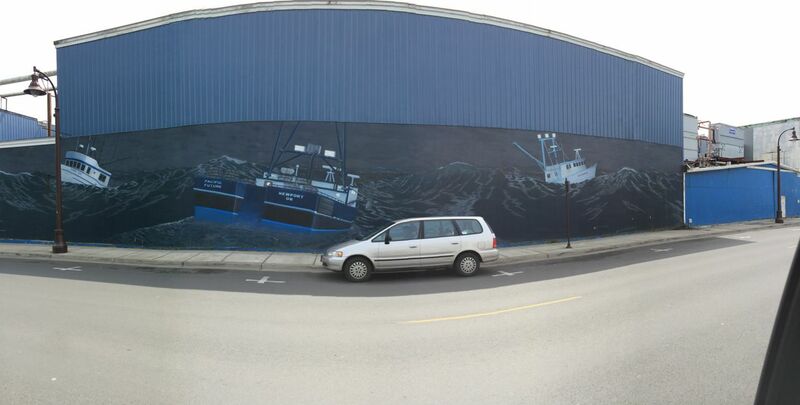 You'd think we were in the fall offshore San Diego rather than the spring along the Pacific Northwest coast. 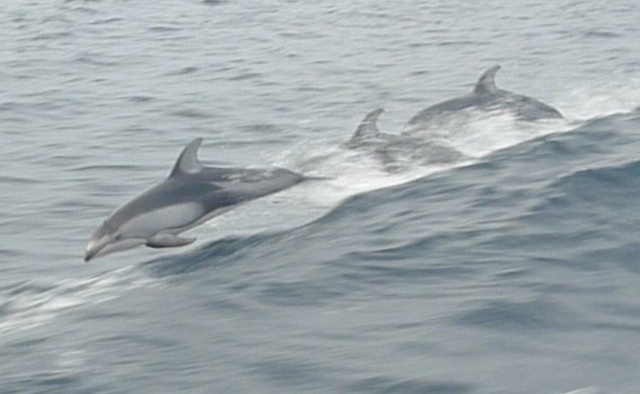 We saw a small pod of dolphins today and yesterday four large whales were spouting about a mile from the ship right around sundown. The food on board the Oceanus has been great and the ship's crew have been very helpful, so thumbs up on all fronts. Enjoy the photos! 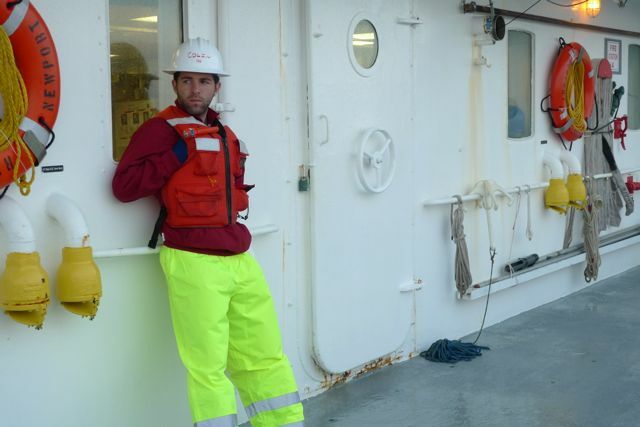 One of the first things you do on a research vessel at sea is to hold a safety drill. Here are some photos of Esteban Bowles-Martinez (OSU grad student), Danny Feucht (CU grad student), Paul Bedrosian (USGS) and Jake Perez (SIO Marine EM Lab) trying on their immersion suits (they are also known as gumby suits for obvious reasons). If you have to abandon ship ever, especially in cold waters such as here, these things give you a ray of hope for surviving until a rescue arrives. 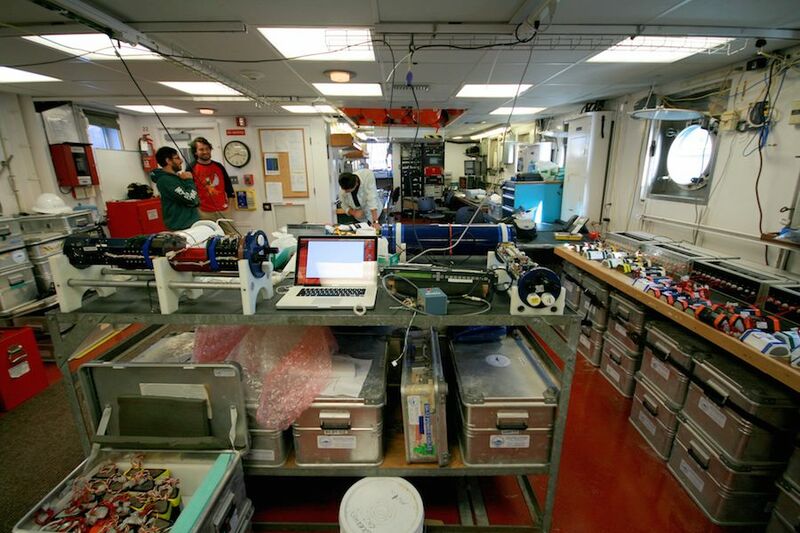 Below is a photo of the science lab on the Oceanus. To the right we have the battery charging stations loaded up with NiMh packs. The center island is the logger checkout station where we battery up, time sync and program the loggers prior to their deployment to the seafloor. 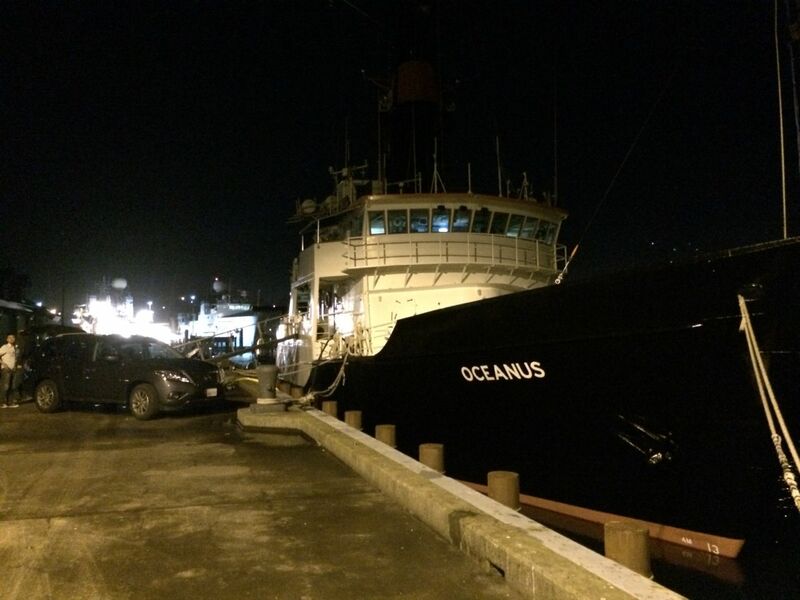 April 28, 2014: Today was our mobilization day on the R/V Oceanus. Chris, Jake, Yuxiang and I spent the night aboard last night and waited around this morning for our shipment of gear to arrive. The first truck pulled up just after breakfast but the second truck carrying most of the gear didn't show up until well after 1 pm, so it was a busy afternoon for the forklift and crane teams and we all pushed hard to get everything loaded aboard and secured before dinner. 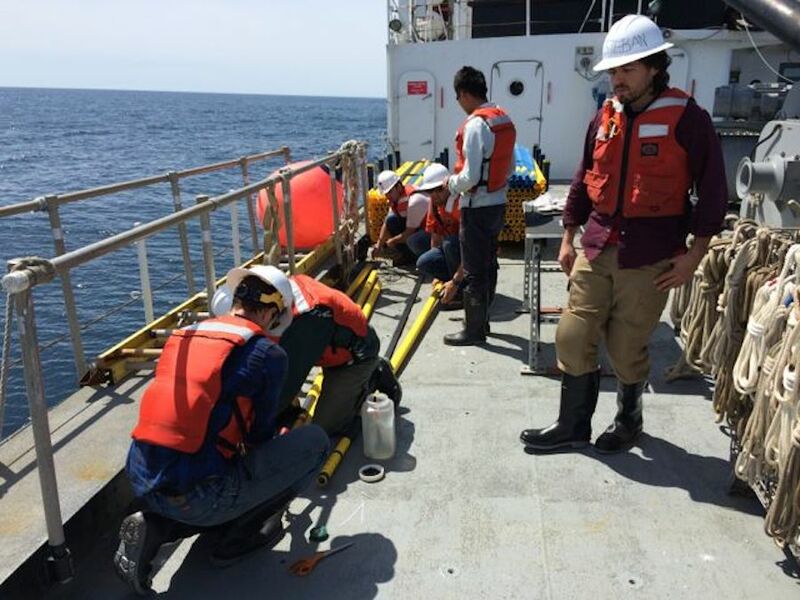 The rest of the marine EM team, Samer, Paul, Danny and Esteban, showed up in the later afternoon and helped us crank through strapping all 55 seafloor EM receivers to pad-eyes bolted into the deck. We finished around 7pm and beelined for the Rogue Ales Bayfront Public House for dinner and last drinks (all UNOLS research vessels are dry ships). There's more to say but its late and there's lots to do in the morning before we push off and head out to sea, so time to sign out. 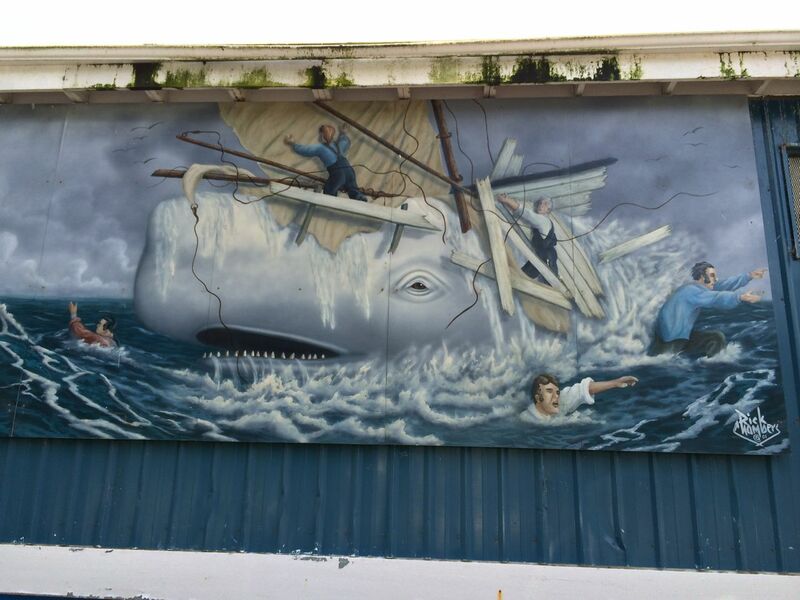 Enjoy the photos of today's action, including the very inspiring murals seen on the walls of buildings in the Newport waterfront. 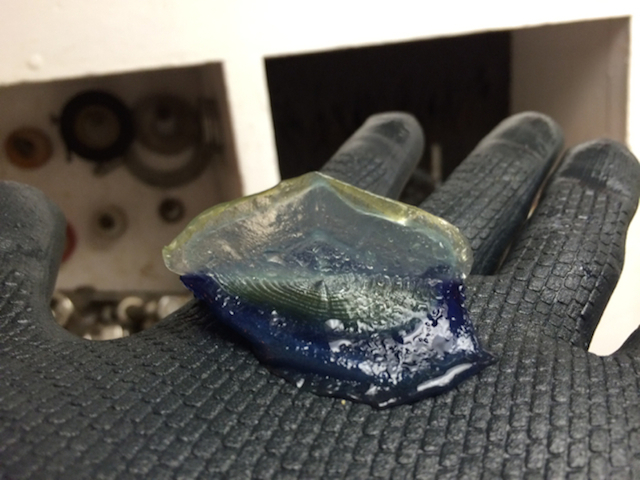 April 27, 2014: Last Friday was a super busy day of cruise preparations. For one, it was the ONLY day we had to get our fleet of EM gear ready to ship to Newport, Oregon. Normally our lab crew will spend about a month servicing the instruments, replacing expendable and broken components, charging and replacing batteries, and preparing them to be shipped. However, that was not the case this time since all the gear was being shipped back from a January project off Uruguay and the expected few weeks of shipping turned into a nightmare of delays from various shipping company and customs officials along the Uruguay to Brazil to Panama to Long Beach, California route. Over the past month we slowly watched our safety window shrink more and more, until at last the three shipping containers arrived in Long Beach last Monday. While that would have given us several days to prepare the gear and breath a sigh of relief, luck was not on our side and our containers got flagged for special X-ray scanning by US Customs. Then there was another delay from two sets of paperwork that didn't agree with each other and apparently the guy who needed to sign off on it doesn't work on Wednesdays (seriously!). Then there was the possibility that it might not even make it down to Scripps before Friday and would sit on the dock all weekend since the docks and truckers don't work on Easter weekend, and then we would have to cancel the long awaited MOCHA deployment cruise. So you might be thinking we were really unlucky, but rather I'd say we were lucky since at last on Friday morning our containers arrived at Scripps, and thanks to an amazing team of engineers, techs and several students we were able to service all the gear, replace some broken bits and pack it all up in about 8 hours. 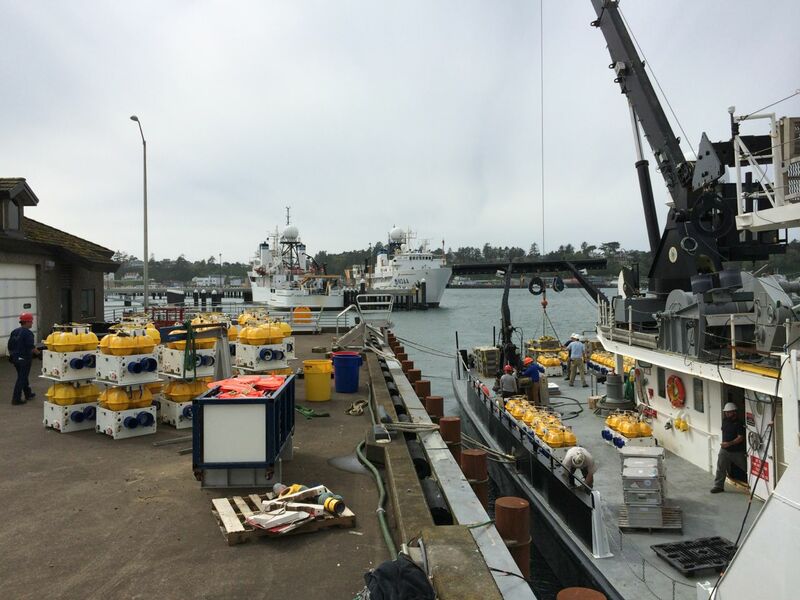 On Saturday the gear was placed onto two trucks that are presently somewhere in Northern California and will meet us at the R/V Oceanus in Newport tomorrow morning. Below are some photos from the action on Friday. 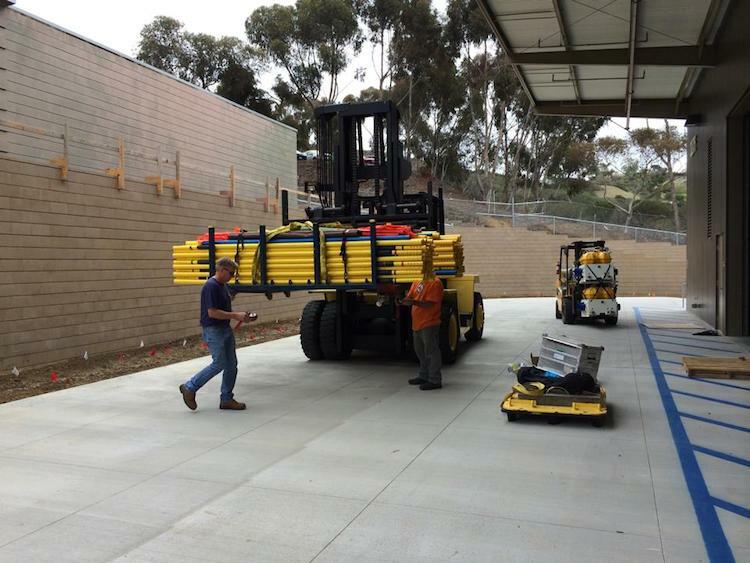 By another stroke of luck, Scripps let us become the first new tenants in a brand new storage and staging warehouse in Seaweed Canyon (behind the Birch Aquarium) and that let us spread out quite a bit. Thanks to the team for their hard work! April 25, 2014: Here's a map showing the planned offshore magnetotelluric stations and the existing onshore stations (the red MOCHA cups). Also shown are MT stations OSU and the USGS will collect around Mt. Saint Helena and Mt. Adams as part of the iMush project.